“Hurry Down Sunshine . . . stands the test of time. Michael Greenberg’s intense and probing mind offers a singular perspective on a universal experience. 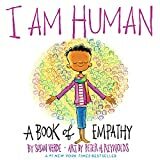 In the third picture book by this talented team, I Am Human teaches both compassion and mindfulness, popular trends in children's books these days. “Studies from the Holocaust have revealed how social death preceded physical death, tracing the creep of generalizations, exclusions and dehumanization of Jews that made mass murder possible. Also Human is a book about medical doctors.